The final meet-up of this year features synthesizers and Loop 2016 Berlin report!! In this meet-up, Yoshinori Saito, the synth guru of Tokyo Ableton Certified Trainer will show how to make a good synth sound. And synth is commonly used in ambient music, so Yui Onodera who participates in compilation “Pop Ambient 2017” from German great label Kompakt, shows how to make an ambient music. In addition, we will report about Loop 2016 Berlin which is a summit for music makers. Loop is not well known in Japan, but they have much intensity so this report will show future music making. Please note: All programs use Japanese language. 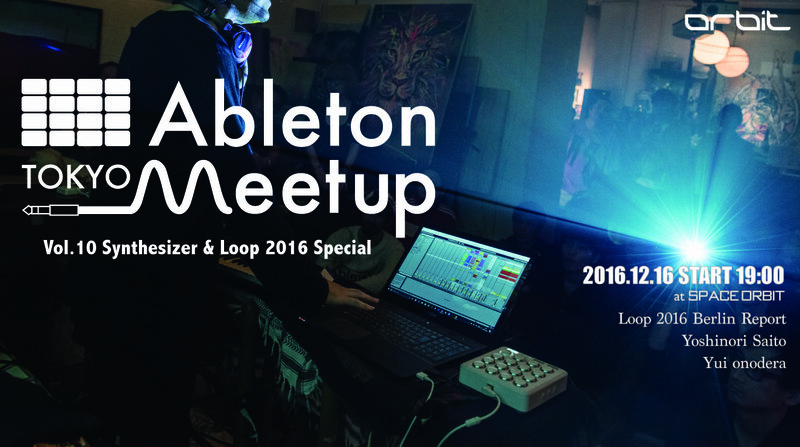 Ableton Meetup is a Ableton user community based in Tokyo. We gather regularly to find common grounds in us. We use the term Meet up to share and find ideas for each other. Berlin born music creation software Ableton Live is not only used for electronic music but also used in Media art and other genres of music. They have variety of users and the way they use the software is starting to diversify. We try to understand the diversity of the people and try to build a community across different genres. We meet up every 2 months to discuss and present our strength in the way we use Ableton Live, each time we invite artists, engineers, DJs and VJs to hear their stories. This entry was posted in Ableton, info. Bookmark the permalink.